FaceCrypt's latest personal security app for iPhone, FaceCrypt Pro, will be released September 1, 2015. FaceCrypt Pro includes Touch ID access, which offers users a greater choice in security access to the personal data vault. Pro users will be able to select Face Recognition, Face Recognition with Live Person Detection or Fingerprint Recognition with Touch ID as well as Pattern and Password options to personalize the vault locks. 256-bit encryption, together with a host of inbuilt security features, makes FaceCrypt Pro the leading, most secure data vault for protecting users. FaceCrypt Pro users can now store their own passwords, documents and pictures in a secure data area on their iPhones. FaceCrypt Pro is aimed at business and professional people but can be used by any iPhone owner who wants to protect their private information, especially if their phone is lost or stolen. FaceCrypt Pro also now includes more options for importing and exporting with other applications. Users can benefit from a 30-day free trial, followed by an optional monthly subscription of just $2.99. The app is available now through the App Store. 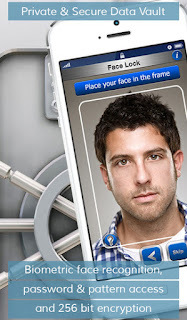 0 comments on "FaceCrypt Pro is Personal Data Security Application for iPhone"